There is so much to discover in Sussex! This being said, it is not always cheap. If you are looking for some fun activities to do with your children or nanny children at the weekend that are fun, family orientated and don’t break the bank, then hopefully this article will help. Brighton is such an exciting place to visit with lots of different attractions to see and lots of activities to take part in. Perfect for families and nannies, providing entertainment and excitement for all! Brighton Fishing Museum – Free Admission, open 10am – 5pm Monday – Sunday – Perfect place to find out about the fishing and beach trade. Suitable for all ages to enjoy. Beach Railway – The perfect way to see the sights of Brighton Beach, whilst sitting back and being taken on a ride you will be sure to enjoy. A 1 mile long route that runs between terminal stations at the Aquarium (close to the Palace Pier) and Black Rock (close to Brighton Marina). There is a fee to go on the railway, but it is a reasonable price. You are also able to buy a family ticket which you may find will be cheaper than buying individuals. Traditional sea side activities – Lots to take part in along the beachside. Activities that children are going to love including a ‘merry go round’. Brighton Pier – One of the most iconic places to visit in Brighton. An ideal place to visit with children of all ages. 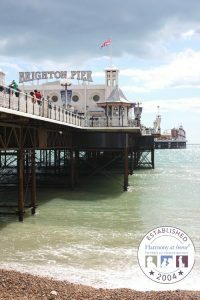 With free admission onto the pier, you are then able to visit various food and drink outlets, sampling the famous fish and Chips that Brighton has to offer, or picking up some of the traditional seaside treats like a Mr Whippy ice cream or some tasty donuts. When tummies have been filled, check out the pier’s attractions, arcades and rides. Lots of rides and amusements to choose from to suit different ages of children. The great thing about the pier is you are able to keep costings minimum. You may decide to set a limit for your children in terms of ride money or just enjoy the views that are on offer. A fantastic family day out that can be enjoyed on a budget. The i360 is the tallest moving observation tower in the world and is an exciting way to see Brighton & Hove all at once. Located on Brighton Beach close to the iconic West Pier. Suitable for children and ideal for families. Children are able to point out key landmarks, ships and all exciting things that they see. Children are also able to enjoy animations showing how the i360 was built and there is also a free app that can be downloaded to enjoy a photo hunt around the attraction. The i360 is not free and you do have to pay a charge to go on. However, children under 4 will go free and if you book online, you are able to save some money on your tickets. Lots of fun to be had at Tulleys Farm. An ideal day out that it suitable for children of all ages. Lots of seasonal and day to day events take place during the year at Tulley’s Farm, so there is always something to do and take part in. There is also a tea room to enjoy, a courtyard to explore, a play area to have lots of adventures in and an animal patch to get up close with some of the animals Tulley’s has. There is free admission into Tulleys. If you want to take part in a special event that they are running, then there would be a charge to pay. Washbrooks has it all! Animals, climbing frames, sandpits, tractor rides, a football pitch, a zip wire and lots of play areas all to be discovered. They also have a place to relax and grab a cup of coffee or some lunch when needed. Open everyday form 9:30 – 5pm. There is a fee to enter, however children under the age of 3 go free and if you are a family of 4 you can save on ticket prices. Tickets are very reasonably priced and it is definitely worth the trip. With so much to see and do, little ones will not get bored. If you and your family prefer a quieter place to visit and spend time together then why not visit a National Trust place. Sussex is home to lots of National Trust establishments that have stunning scenery and are child friendly. An exciting and educating way to spend the day that all are able to enjoy. The admission of these places is not free, so if you are planning on visiting make sure you plan ahead and decide on the perfect time of year you would like to go and what events would be best suited to you and your family. Sussex has so many exciting things to offer and lots of exciting places to see. Hopefully this article has helped you to gain an understanding of them. There are lots of activities and days out to be had that don’t cost a fortune. Spend time with your family or Nanny children discovering what Sussex has to offer.